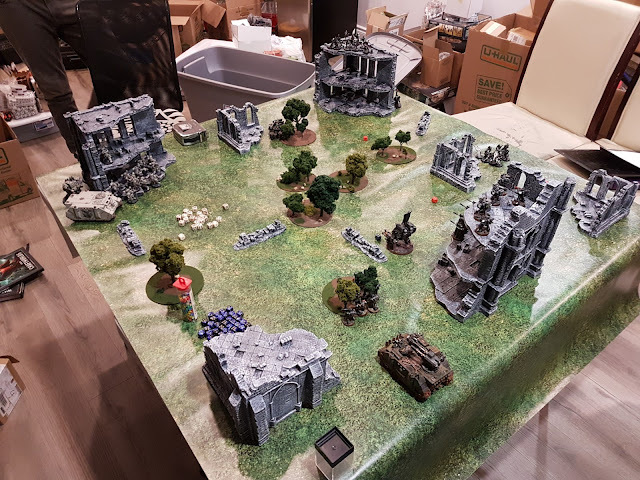 For a couple weeks my friend Ivan and I have been planning on getting together to try out the Relictor army that he recently picked up. I used to play Warhammer 40k with Ivan every other week back in high school, but the last game we had together was the summer after our first year in university... Almost 11 Years ago. I was excited, and when I heard that Ivan has invited Wesley (who's Eldar army fought in our last battle) I knew this was going to be an amazing blast from the past! With the possibility of a fourth player joining us (who did not), we left the specifics of the game to the last minute. Everyone would build their armies the day of the battle, and we would decide exactly what we were going to do then. Ivan had snagged a ton of Codices recently, and brought them over for me to use/hold onto in JADE's dedicated gaming space. 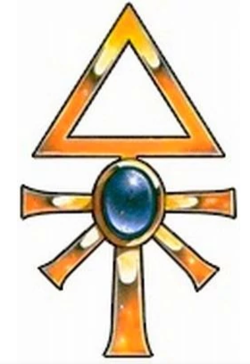 He brought with him a Thousand Sons Codex, a Dark Angels Codex, a Drukhari Codex, and an additional Craftworld Codex... The only thing he forgot was the Space Marine Codex that he needed to run his Relictors! Not to be deterred, he grabbed the Dark Angels Codex and ran them his army as a Dark Angels force instead. We were ready to go! For this match, as usual I played my Death Guard, Wesley Took control of his Eldar and Ivan the Dark Angels. Since I am currently using my third 2' x 4' table as a temporary computer desk, we only had a 4' x 4' area. This wasn't really enough space for 3 armies to work with... But we had to make do. So we decided on a smaller battle using very limited forces that could fit in the area and set about designing our forces. 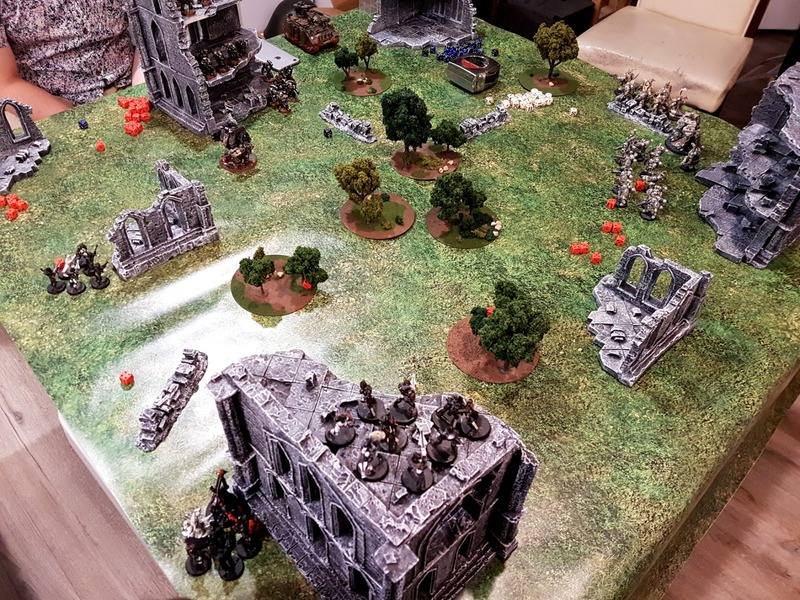 This was both Ivan and Wesley's first game of 8th Edition so while we made our armies I took some time to go over the many many rule changes and how the story had advanced. The last edition these guys played in was 4th ed so we had a lot of game concepts that were introduced, and of course lore to catch up on. 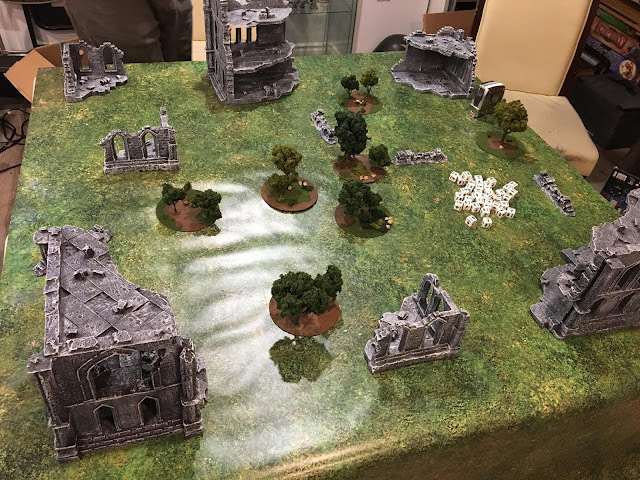 Like in our last game, to keep things simple, we chose an open play scenario and ignored the power level rules in favor of the more balanced points system. It took some time for everyone to go through their lists and codices but finally we got the forces assembled. And were ready to play. Ivan's force was heavy on range with snipers, missile launchers and lascannons. He trenched these forces around the ruins providing optimal cover and shooting vantages. His vanguard was comprised of a Dreadnought and the Scout Bikes that he hoped to tangle his opponent's ranged units with. Wesley's plan for this game was to focus on and learn just how good his Dark Reaper units are. He took Guide, Protection and other unit buffs on his Farseer and warlocks to help his Eldar with a predominantly ranged strategy get those shots off and take the hits. I had planned to let Ivan and Wesley's force duke it out using their ranged weapons. My Shorter ranged force wouldn't pose a threat until at least turn two, and I was certainly able to take a pounding while I advanced if it came to it. Once I was in range I would leap on my weakened opponents, overpowering them with my superior close combat skills. We built the battlefield together to ensure as balanced a field as possible. We had such a small area that any tip of the balance in terrain would mean the difference between victory or defeat. So Ivan made sure that each area was roughly the same size and meticulously measured out the starting positions. We would each control a sliver of the map around one of the three large ruined buildings. Since this was Ivan and Wesley's first time playing 8th again we played a simple Annihilation match. I wanted them to focus on rules and figuring out how their army works ion the edition without needing to worry about capturing objectives. This was just to get a sample of what the game was like now, and I assured them that we would soon move on to grander ideas. I won the initial are selection and unit setup and took last placement. I selected the area in the right hand corner (as seen above), Wesley selected the area to the left and Ivan took the central position on the far side of the table. Wesley had hidden most of his army behind the large ruin that dominated his deployment zone. His Dark Reapers however he placed on top of that ruin: giving them cover and a commanding view of the table. Ivan had infiltrated a group of Scout Bikes in front of the ruin, hoping to catch the Dark Reapers in a charge, but it was to no avail. After using some psychic powers to buff his rangers and Reapers Wesley open fire at Ivan's force. The Scout bikes were taken out in a single blast of missile fire, but the Devastators remained unscathed. Ivan had also placed his "missile squad" on top of his ruin, and began barraging Wesley's Dark Reapers with his Devastators. But their armour save was simply too high, and they shrugged off the hail of missiles. Ivan then turned to his razorback which was squarely pointed at my corner. He targeted my Rhino, and both shots from the Twin-Linked Lascannon hit dealing a whopping 10 damage! The rhino was destroyed, but thankfully for me did not blow up in my face. With my Rhino destroyed my plan to charge Wesley's Dark Reapers with my Possessed Marines was going to be impossible since the Dark Reapers would cut them down before they arrived. So I had to change my strategy and hope that Ivan's army would be distracted by the Eldar while I slowly moved towards his position. I figured that my Dreadnought would be able to take out his Razorback the same way he took out my Rhino... But both of my shots missed and my heart sank. I could already tell this was not going to be my game. Without a direct threat at his doorstep, Wesley was able to direct the fire of his Dark Reapers at Ivan's Dreadnought, severally damaging it with a series of successful hits. 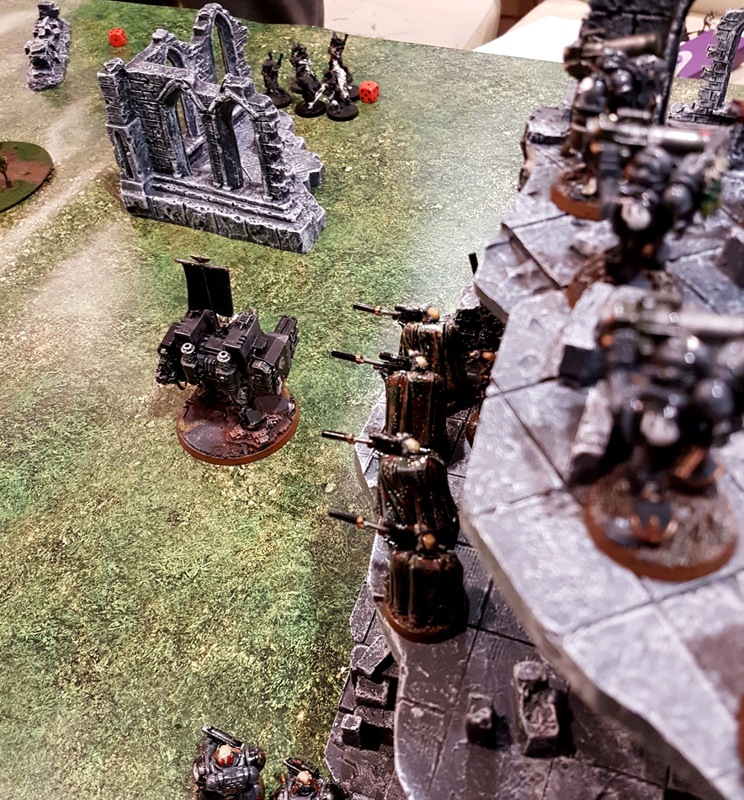 His Rangers which had infiltrated the field, began opening fire against the devastator, hoping to stay the fury of missiles aimed at his reapers. Wesley chose not to attack me this round. Realising that the Death Guard would not be a threat until next turn, so he really didn't see the point. Again Ivan fired his Devastator's frag missiles against the Dark Reapers again, but they were simply too well entrenched and he only managed to kill a single model. Shaking his head Ivan cursed the Dark Reapers and turned his attention again towards my force. Ivan's Razorback stole the turn and crippled me in another amazing blast. Aiming it's Lascannons at my Dreadnought, he destroyed it with another two successful blasts. Any threat I could bring against him had been vaporized. I had no Rhino to transport my troops, and now with my Dreadnought down, I had no heavy weapons. I was not going to win this game. My rolls and luck had simply been too bad and my army was nerfed each turn before I could use it. Slowly, but not daring to charge fully into the open, I started to position my force. Without a Rhino I was not going to be able to charge Wesley's corner so my only recourse was to aim my force at Ivan and hope I could get my possessed there to do some damage in time. Wesley's entrenched position was severing him well, and he was not ready to leave the safety of the ruins just yet. However he was concerned that his luck against the Devastators would not hold out, and again he turned the Dark Reapers against them. I imagine this as a hail of missile fire flying over top of the battlefield as the Dark Reapers and Devastators bombard each other's positions, as the other forces battle below. A very cool image and a successful attack that finally started to whittle the Devastators down. Wesley's Rangers then started firing at Ivan's Scouts, but using his own camo and cover he was able to brush their attacks off. He had considered it, but not willing to bring his Wraithlord into the fight just yet Wesley called it a turn. Again Ivan began by firing missiles at the Dark Reapers, but with fewer and fewer Devastators each round the attacks were becoming increasingly ineffective. 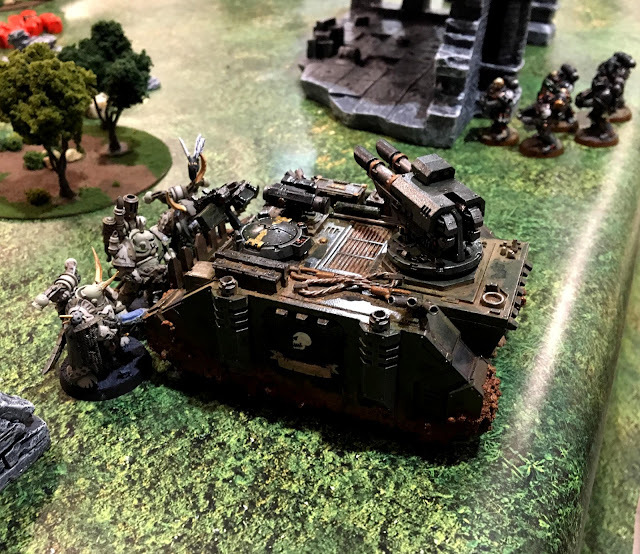 Feeling that I simply wasn't a threat Ivan also turned his Razorback against the Dark Reapers, finally managing to score a few some wounds with the Lascannon. During his charge phase, and feeling that his badly damaged Dreadnought would be good for little else, he charged it at Wesley's Rangers, thinking he could wipe them out if he got a good charge. It was unlikely that it would be effected by overwatch so he felt it was a good gamble. Boy was he wrong. Wesley rolled two 6's to hit, and then two 6's to wound for his overwatch... Just enough damage to destroy the incoming Dreadnought. 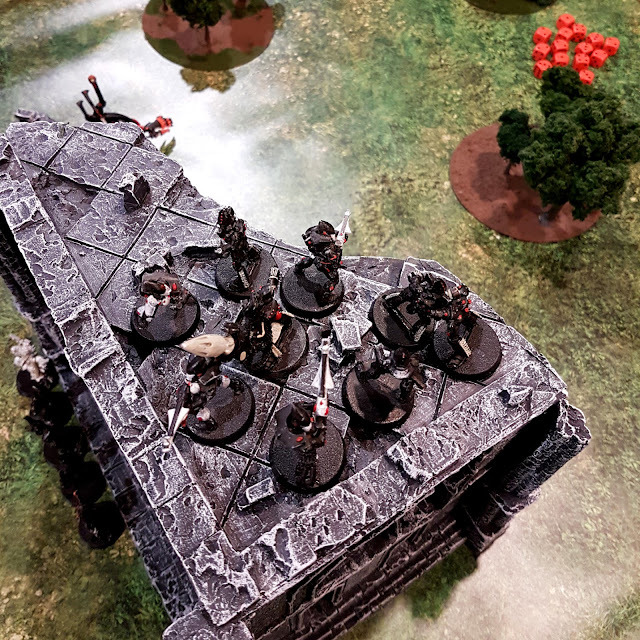 With jaws drops and between fits of laughter we imagined a terrified squad of Eldar Rangers breathing an ecstatic sigh of relief after an impossibly lucky shot. So after being set back by basically two turns I was finally in range to start doing some damage. So using my Malignant Plague Caster I started to a smite Ivan's Librarian dealing my first bit of damage all game. I also got my Plague Marines into range and got off a few shots at Ivan's Space Marines. It wasn't much, but frankly it was better than I had been doing for the past two turns. After doing some damage to Ivan, Wesley decided that my army was actually a threat, and turned those dreaded Dark Reapers against my Plague Marines. He wiped five models out and I lost a further two during the morale phase. This really wasn't my game. After their daring defeat of the Dreadnought, Wesley pulled his Rangers into cover and hunkered down. It was time to bring the Wraithlord out and deal with the Razorback which Wesley saw as the biggest threat on the board (and he was right) However his luck did not hold and both shots missed. 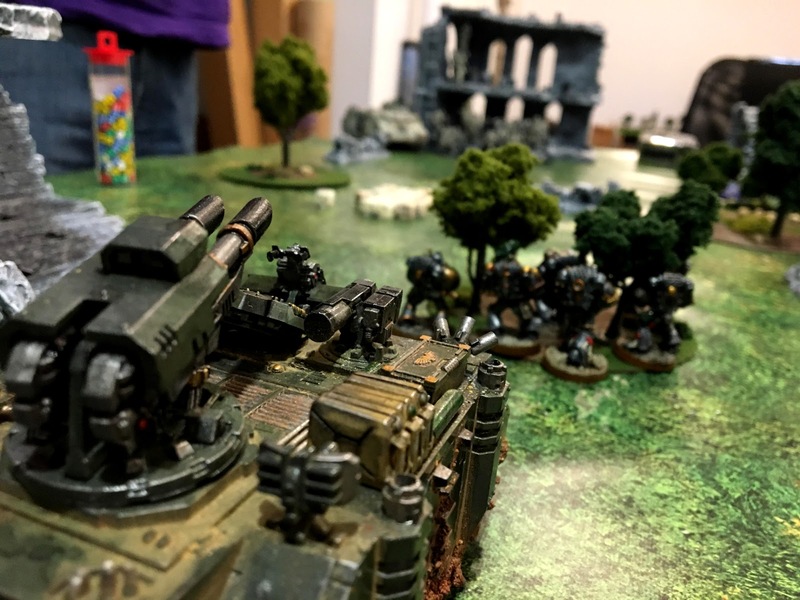 With only a few remaining the Devastators continued their onslaught against the Dark Reapers but every time Ivan fired he had fewer and fewer Marines, making each shot less effective then the last. With the remains of my army closing in, Ivan's librarian killed my Plaguecaster with a very lucky smite roll. However, Ivan's ability to dole out damage had been slowly eroded over the course of the game. Realising he couldn't win he started firing at my units just to do as much damage as possible. My remaining Plague Marines managed to take out the Librarian, but that was about it. I had lost this game on turn two and there really wasn't a lot I could do to change that. My Possessed would be in range to charge next turn, so at least maybe I could do some damage. However, being honest with myself: I was basically tabled at this point. The Dark Reapers finally managed to get rid of the Devastators and the deafening storm of missiles above ceased. Now all that was left was the ground fight. The Wraithlord for the second time in a row missed both of its shots leaving Ivan the chance to respond with his Razorback. The Rangers then cleared up most of the remaining Plague Marines, reducing them to only a Plague Champion. Wesley had won this game. No doubt about it. Ivan's Razorback really proved itself this game and in a last act, in the final turn it managed to destroy Wesley's Wraithlord with two successful hits. Meaning that it had taken out every walker and vehicle deployed by the enemy this game. Knowing he couldn't take out the Dark Reapers, he turned his snipers against my soon to be charging Possessed dropping them to a Squad of three. Ivan couldn't win, but he had destroyed as much as he could. As a joke, I took my last Plague Marine, super charged his Plasma Pistol and fired at the Eldar Rangers. Adding insult to injury and to prove just how bad my luck was that game I rolled 1, missing and taking a mortal wound in the process. We all had a great laugh about that. This really wasn't my game this time. The Possessed after five turns finally got into range and charged the Razorback dealing a number of hits, but not enough to destroy the vehicle. And that was that. I had run out of units to command. The Eldar won a clear victory having only lost a handful of models from their starting force. 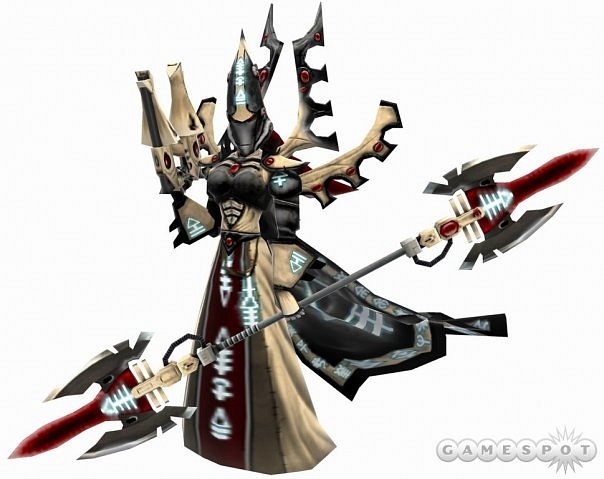 Wesley really figured out a good system for buffing his shooting and defense rolls that made the Dark reapers just a devastating unit this game. So well fought Wesley! 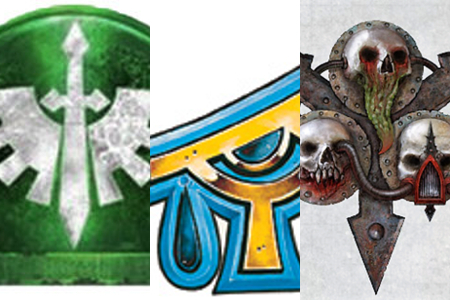 While talking after the game, Ivan commented on how he would like to try out a larger force, but was pleased with how is army functioned over all in 8th edition, thinking that the Dark Angels had some pretty interesting rules that he could work with. Wesley really likes how streamlined the new rules are, and how the buff system works in his army. He feels it just makes more sense from both a game and lore perspective and is looking forward to also fielding a larger force. Despite that fact that I got whooped this game I had a good time! Honestly I picked the wrong starting area, and bad rolls and bad luck did not help that situation. While I am coming around to 8th Edition, my one remaining concern is that this is the third game in a row that we have been successfully able to call the winner by turn two. Perhaps it is simply the annihilation scenario we are playing, and we need to go on and explore the other scenarios in open and narrative play. But for now it remains a concern of mine. Next game we are going to try out something new with a more objective based game. I really want to see how this changes the game and if it makes it a little more balanced. Ivan and I also have plans for a large story based campaign that we hope to play through. We are still working out the details, but there will be many more colourful battle reports to come.